Why is the BIO IONIC Onepass Straightening Iron so Effective at Straightening Hair? Do you avoid straightening your hair every day because you feel it takes too long to do it? That way of thinking is shared by many flat iron users. The thing is it does not have to be that way because many salon professionals have identified some flat irons they say work really fast. One name that often comes up in this conversation is the BIO IONIC Onepass Straightening Iron. Read on as we take a closer look at this BIO IONIC flat iron to see if it works as fast as stylists say. The features of this 1.5-inch flat iron by BIO IONIC are really too many to mention them all. You have far-infrared heat generation, 5-heat control settings (240°F – 400°F) and Bioceramic technology for 10-second heat up and more. It even features Nano ionic technology. This technology is said to help hair retain up to 25% – 75% more moisture than other types of hot plate infusion on flat irons. Your hair will not frizz, dry out or get split ends if you use the settings in the right way. This flat iron is really easy to use despite its slightly bulky 24-ounce weight. It has a dial-up heat control that is very accurate. You don’t have to worry at all about the power cord length either. This flat iron has a long 10-foot power cord with a convenient swivel end that will keep the cord from getting tangled up as you use it. 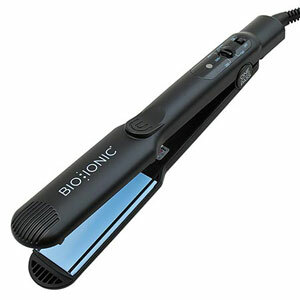 For safety purposes, BIO IONIC has an automatic shutoff switch built into this model flat iron too. There are two main reasons why we think this flat iron does such a great job straightening hair. One is the fact it has triple lubricating strips on the heated plates. That makes your hair flow across it very easily and without catching. 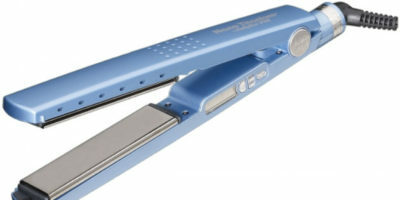 It is one of the ways that make this one of the fastest hair straightening flat irons you will find. 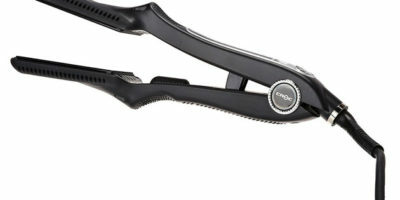 Perhaps the biggest contributor to how well the BIO IONIC Onepass Straightening Iron works is its Bioceramic technology. This hot iron is ready to use in less than ten seconds and once it gets hot that temperature stays hot and heats evenly across the heat plate on this flat iron. It also adds additional smoothness to the surface of the flat iron hot plate. The warranty on this flat iron is among the best you will ever see. BIO IONIC will stand behind it for a period of 5-years. That is some great piece of mind you get when buying this flat iron. This was not a perfect flat iron model either. One thing we were a little unsure of is the fact that it does not go over 400°F. We typically like to see a little higher heat for use on very thick or very coarse hair. Speaking of which; most thick and coarse hair users will not find this a one pass flat iron (not that any are on those types of hair). We all think this is an incredible flat iron. As usual BIO Ionic has made an electrical hair styling product that is a step above many of its competitors. It heats up incredibly fast and straightens your hair incredibly fast too. 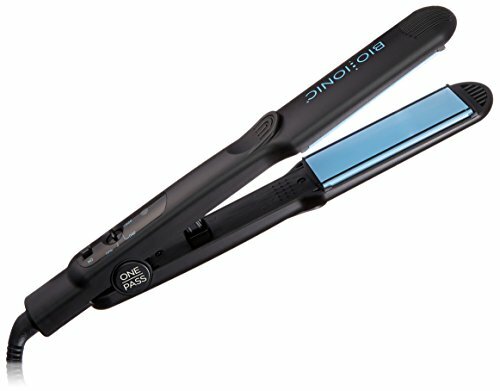 The BIO IONIC Onepass Straightening Iron has a variety of different temperature settings and comes with an amazing 5-year warranty too. It should be high on your list of possible choices when you are getting ready to buy a professional flat iron.